Greetings! Here is our current list of events and activities for the upcoming summer and fall. 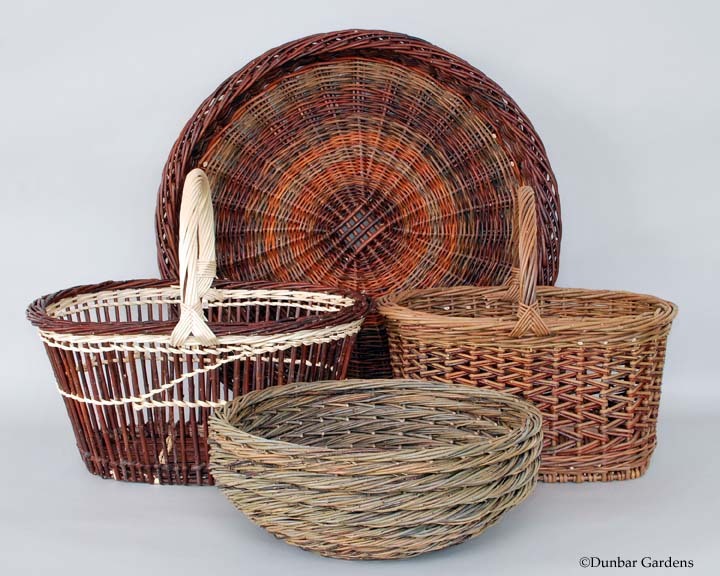 We are especially excited about Katherine’s trip back east for the Cole-Ware Collection opening at the Smithsonian’s Renwick Gallery and the National Basketry Organization conference at Arrowmont in October. Scroll on down for the details. Bellevue Arts Museum ARTSfair: July 26,27,28, 2013, Bellevue, WA. One of the region’s largest and most prestigious arts fairs hosted by the Bellevue Arts Museum. Katherine is excited to have been accepted into this juried show and will be in space H-13. 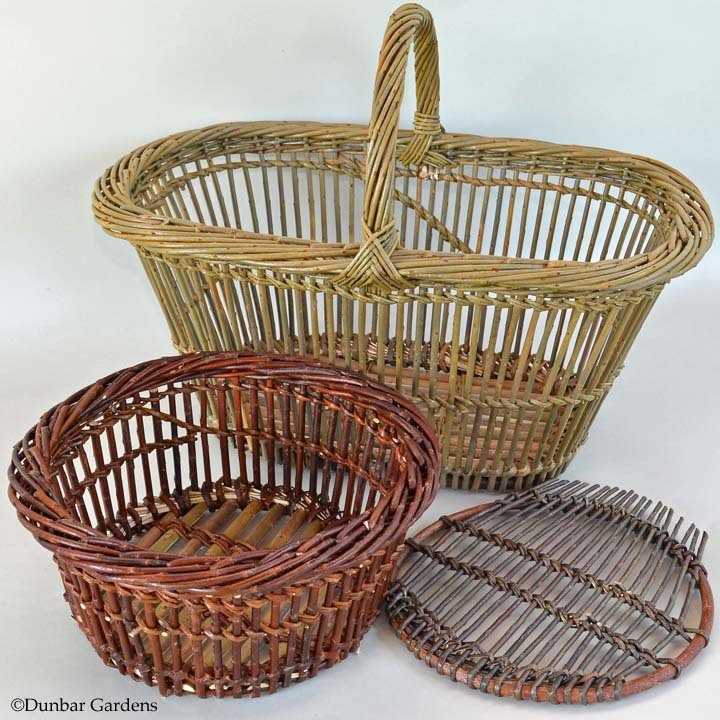 She will have many new baskets and has a large enough booth to demonstrate her work during the show. Art of the Garden – Schack Art Center: June 13-August 1, 2013, Everett, WA. Garden art and art to bring the garden into the home in a wide variety of medium. Katherine’s piece in the exhibit is this Irish potato basket form she named “pumpkin patch” because of its orange and black colors. Anacortes Arts Festival – Experience Art: August 3 & 4, 2013. 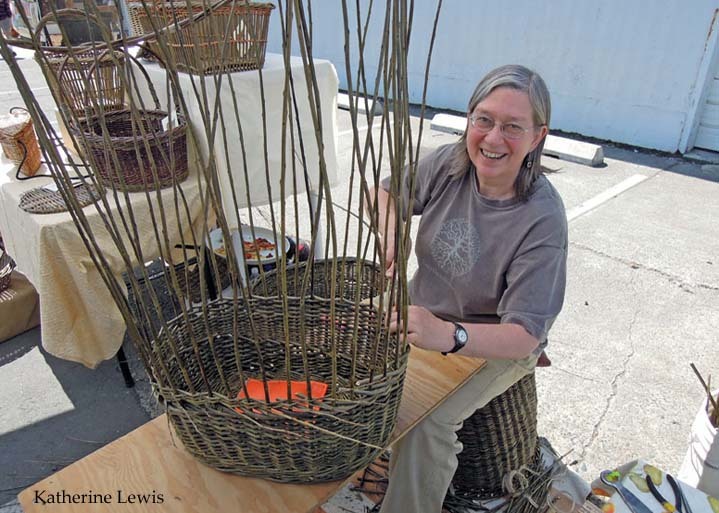 Katherine has been invited to demonstrate willow basketry as part of the artists in action area at this year’s Anacortes Arts Festival. You can find Katherine working with several artists in a variety of forms just north of the food court area near the Arts at the Port exhibits. All Things Considered VII – sponsored by the National Basketry Organization: August 24-October 19, 2013 at the Arrowmont School of Arts & Crafts in Gatlinburg, TN and November 20, 2013-February 26, 1014 at the Fuller Craft museum in Brockton, MA. 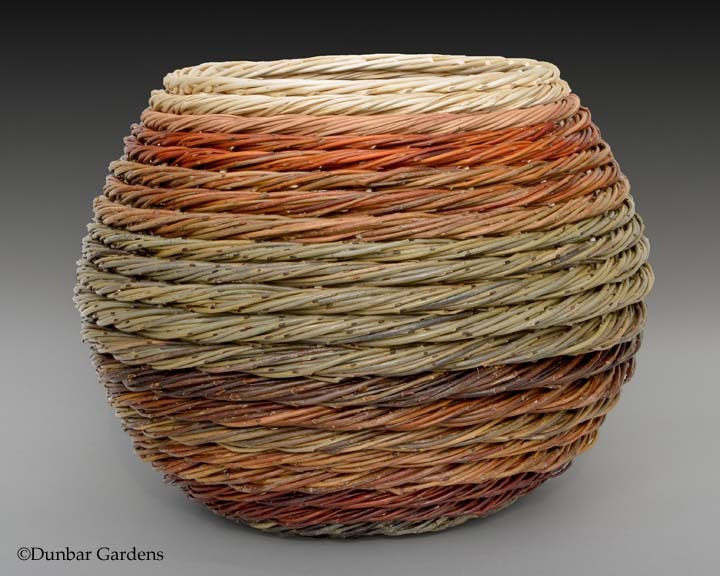 An exhibit of invited and juried works showcasing both traditional and sculptural basketry while representing the depth of outstanding technique and innovative design. Katherine’s entry is titled “Sorted out”. A Measure of the Earth: The Cole-Ware Collection of American Baskets: October 4-December 8, 2013, Smithsonian American Art Museum Renwick Gallery. Katherine has several baskets in this collection that was generously donated to the Smithsonian by collectors Steve Cole and Martha Ware. Katherine is planning on attending the opening of the exhibit in October. She is looking forward to meeting the collectors as well as many of the other artisans. As a maker of functional craft, it is an honor to be part of an exhibit at such a prestigious decorative arts venue. There will be an exhibit catalogue authored by curator Nicholas R. Bell with photos of all the baskets and interviews with the makers. There might even be a couple of photos from Dunbar Gardens in the catalog. The public opening of the exhibit on October 4 will include a special program highlighting the exhibit. Katherine is providing one of several baskets for a “hands on gallery” where visitors will be able to pick up baskets similar to the ones they have seen in the exhibit. Pass the word to friends and family who will be visiting Washington, DC to put the exhibit on their itinerary. Currently there are no classes scheduled at Dunbar Gardens or the Mount Vernon area. Katherine is busy weaving baskets while attending to family obligations so she has cut back on her teaching schedule this year. However, Katherine is teaching at the request of some basketry organizations in other locations. October 8-13, 2013: National Basketry Organization Conference at Arrowmont in Gatlinburg, Tennessee. Katherine is honored to have been asked to propose a class for the NBO conference. She is going to be teaching scalloming and fitching with willow. Working with bark-on willows from our farm, participants in this workshop will work on two techniques in willow basket construction, scallomed-on stakes and fitched sides. Scalloming involves cutting a tail on the end of the willow stake so it can be attached to a base hoop, making the size and shape of the basket dependent only on the hoop. Fitching is an open work weave. 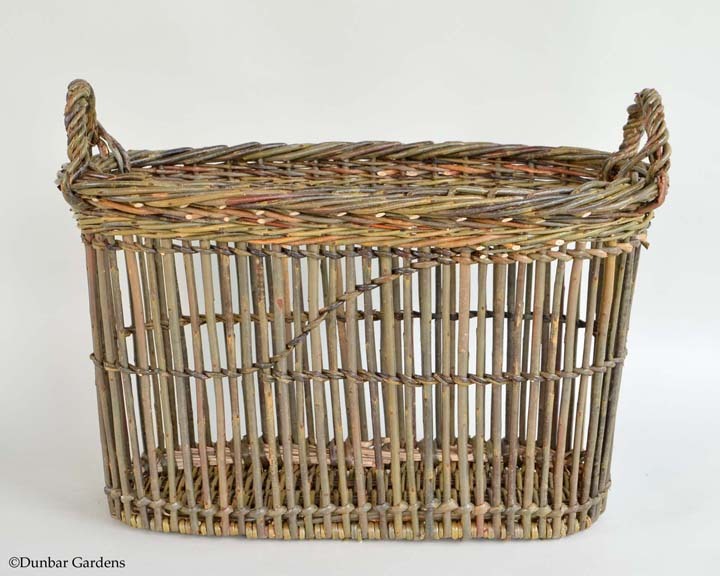 Combined with scallomed stakes, it makes a strong and lightweight basket with elegantly simple lines. Participants will learn different base construction methods before learning to cut scalloms. Projects will be tailored to each student’s individual weaving level. Students can expect to make one to two baskets or fitched trivets. Class will be just a part of the activities at this gathering of basketmakers. Katherine will also be giving a presentation with a slide show of her 2011 trip to basketry festivals in Europe. See the NBO website for all the conference details. We are sorry to announce that we will not be selling produce on the farm this summer. We appreciate the support we have received from our regular customers and hope you were amply rewarded with good food over the years. 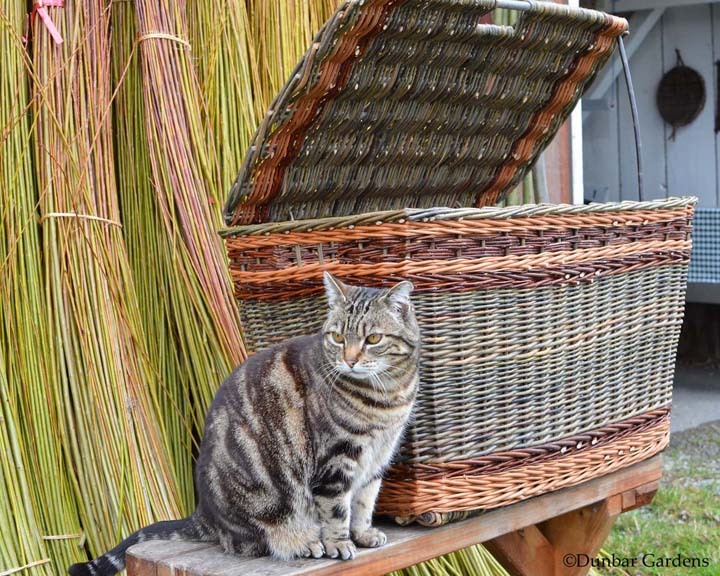 There are many good options now in the Skagit Valley for farmers markets and farmstands so we have decided to focus on our willow basketry business. 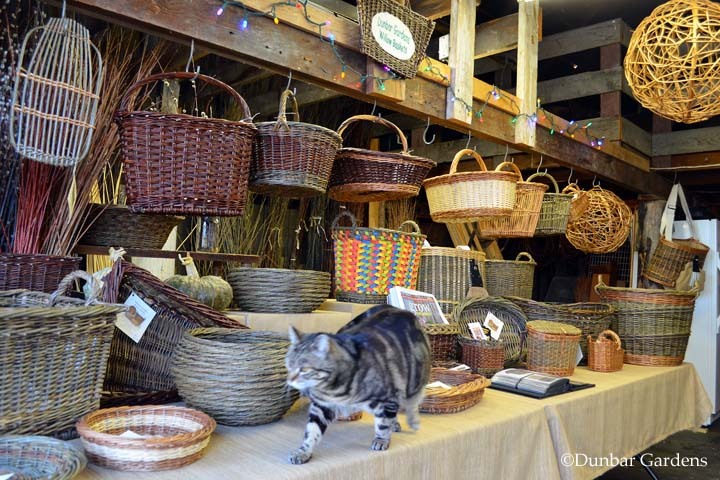 Of course we are open every day if you would like to look at the baskets we have on hand. Don’t hesitate to stop in for a visit. Facebook: Dunbar Gardens has a Facebook page. We post photos of Katherine’s latest baskets, commissions, and photos of the farm. For more information about classes, baskets, willow growing, or our farmstand please visit our website. Thanks! 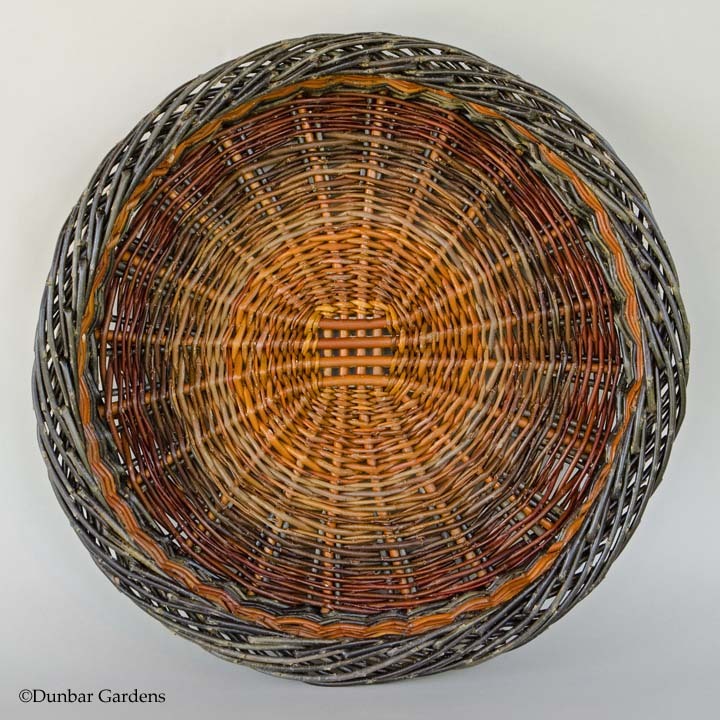 This entry was posted in Newsletters and tagged basketry, Katherine Lewis, National Basketry Organization, willow baskets by Steve@DunbarGardens. Bookmark the permalink.